"A new study... has found that a group of volunteers who consumed a serving of canned soup each day for five days had a more than 1,000% increase in urinary bisphenol A (BPA) concentrations compared with when the same individuals consumed fresh soup daily for five days.
" 'Previous studies have linked elevated BPA levels with adverse health effects. The next step was to figure out how people are getting exposed to BPA. We’ve known for a while that drinking beverages that have been stored in certain hard plastics can increase the amount of BPA in your body. This study suggests that canned foods may be an even greater concern, especially given their wide use,' said Jenny Carwile, a doctoral student in the Department of Epidemiology..."
Brace yourselves, tomato soup fans: the highest levels of BPA are found in tomato-based soups, pastas and canned goods because the natural acidity of tomatoes accelerates erosion of the can lining. BPA has been banned by Canada, Japan, Denmark, Turkey, and France. The FDA promised, then failed to rule on BPA by June 2011. Sued by the Natural Resources Defense Council, the FDA is mulling a similar ban, which could be announced as soon as March 31, 2012. My guess is that the FDA, with its entrenched record of favoritism for manufacturers over consumers, will, at best, mandate a very lengthy period to phase-in any ban on BPA in the United States. Meanwhile, Campbell's, under intense pressure from food activists, finally announced two days ago that "the company... will make the transition as soon as 'feasible alternatives are available.'" Notice that the Campbell's spokesman excluded any mention of a timeline, or a definition of "feasible alternatives." What's a Concerned Tomato Soup Lover to Do? First, stop serving and consuming soups from cans lined with BPA. Do it now for your health and that of your loved ones. Soups simmered from scratch, whether at home or a local eatery, are the healthiest (and yummiest!) alternatives. If freshly made soups aren't possible, buy soups and other goods in glass, pouches, or non-BPA cans. Diligently look for the non-BPA designation on the cans. Second, demand responsibility and public-minded behavior from the FDA and U.S. food manufacturers. Complain to the FDA, to Campbell's Soup Co., and to your Congress members and U.S. senators. Complain loudly. 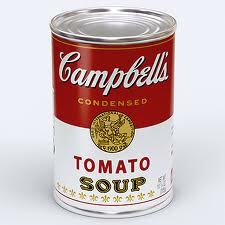 Third, click HERE to sign a Campbell's: Stop Endangering Kids' Health! petition at Change.org demanding that "Campbell’s to stop being an industry laggard and start protecting kids’ health. This petition is in support of the Breast Cancer Fund's "Cans not Cancer" campaign. Fourth, boycott all Campbell's products until the company aggressively moves to replace cans lined with known carcinogen BPA with non-BPA cans. Grocery stores carry delicious alternatives to every product offered by Campbell's. And remember... fresh produce and homemade soups are your best-quality alternative. 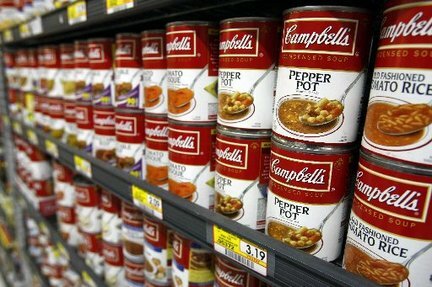 Check back here for updates on Campbell's Soup Co.'s use of BPA-laden cans. Wow! What next! Thanks for alerting me to this, Deborah! Susan, sadly, there is so much that's neither healthy nor right about modern industrial food. Glad that this info was helpful to you. It's been years ago now (so matters may have changed) that I learned from a wholesale broker/salesman that tomato products were foundational to all distributors. When negotiating prices for various categories, manufacturers would insist that the best overall lists would be provided for wholesalers when they agreed to carry a good amount of "red product." Whether tomatoes, sauce, paste or whatever it made no difference. And when you go to the grocery the tomato section is always really big, often covering as much shelf space as multiple other vegetables in that section. Whole, diced, stewed, sauces with many variants, paste, puree... all in addition to ketchup, soups, juice and tomato products in other sections. (He said in the old days tomato paste was a basic item, It came with instructions about how much water to add to make puree or juice.) And as you know tomatoes are quite acid, so canning them presents a real challenge. Glass is a much safer way to preserve foods. It's a shame it weighs so much. I haven't thought about it, but is there a line of products that uses only glass containers? If it can be done for jams, jellies and condiments (also very acid) I see no reason it shouldn't be done for anything in metal cans. So what about other food containers made of plastic? Do they have the same risk?